Vandals have damaged the London tomb of Karl Marx in what the cemetery said Tuesday appeared to be a sustained and targeted attack. A marble plaque with the names of Marx and his family -- the monument's oldest and most fragile part -- was repeatedly hit with a blunt metal instrument, Ian Dungavell, who runs the cemetery trust, told AFP on Tuesday. The damage was reported to the police on Monday. 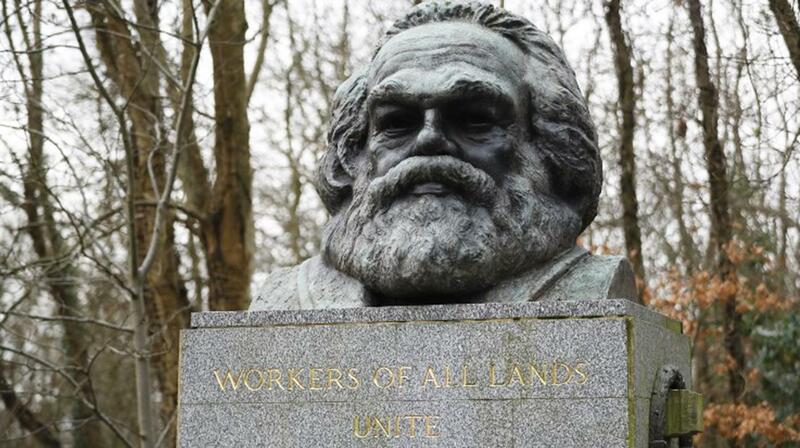 "The name of Karl Marx seems to have been particularly singled out, so it wasn't just a random smashing up of a monument -- it seems a very targeted attack," said Dungavell, chief executive of the Friends of Highgate Cemetery Trust, the charity which runs the graveyard. German revolutionary philosopher Marx moved to London in 1849 and lived in the British capital for the rest of his life. His theories became the basis for communism. He died on March 14, 1883, aged 64. The granite slab monument in north London, 12 feet (3.7 metres) tall and topped with a bronze bust of Marx, was funded in 1956 by the Communist Party of Great Britain. The inset 1880s marble plaque that has been damaged came from the original, simpler grave. The lettering and stonework was damaged, particularly around Marx's name, the date of his wife's death and the name of their grandson Harry Longuet, who died aged four. "I'm personally upset by the physical violence. There was a person there not once, but again and again banging at this with some blunt metal instrument," said Dungavell. "It's particularly naive to think that by a few hammer blows, you're going to encourage sympathy for anti-Marxist views." The monument has been attacked before. The bust has been pulled off, it was attacked with a pipe bomb in the 1970s and it has been daubed with paint and slogans. "It's battle-scarred and has all the marks of a rich and varied life," said Dungavell. "It's not irreparable but it will never be the same again." He said most people would find attacking a grave repugnant, particularly as it was also the tomb of his wife and other family members. The tomb is a Grade I-listed monument, meaning it is among the most important sites in Britain that must be protected and preserved as a heritage asset. It is owned by the Marx Grave Trust, a wing of the Marx Memorial Library in London. Dungavell said the repair attempts would require a specialist stone restorer and an expert to reinstate the lettering. The repairs would most likely have to include cleaning off the rust marks, consolidating the surface so that moisture ingress in the cracks does not cause future damage, and possibly cosmetically toning down the bright white newly exposed marble so it blends in. Police said they had completed their initial inquiries and the investigation had been closed. No arrests have been made. "If any further information comes to light, this will be investigated accordingly," a police spokesman said.